Use Case: Correlate FireEye & Digital Guardian events in the ArcSight SIEM to verify whether incident is under control at the end point. Detection and correlation of threats collected from as many locations as possible across the enterprise offers the best defense against advanced malware. 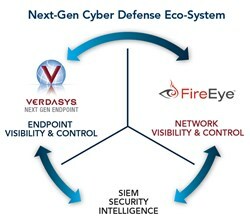 Enterprise Information Protection (EIP) leader Verdasys and FireEye, Inc., the leader in stopping today's new breed of cyber attacks, have announced an integrated security solution combining FireEye’s network with Verdasys’ endpoint defenses through the Verdasys Digital Guardian Connector for FireEye. This newly integrated solution is designed to enable security organizations to quickly investigate, confirm and stop advanced malware threats beyond the network to endpoints, such as physical and virtual laptops, desktops and servers. Available immediately, the joint Verdasys-FireEye solution leverages FireEye’s Multi-Vector Virtual Execution (MVX) engine and Verdasys' Digital Guardian platform to protect intellectual property and other sensitive data against insider threat and malware attacks. Utilizing Indicators of Compromise (IOCs) and other threat intelligence received from FireEye’s MVX engine, Digital Guardian correlates that intelligence and creates rules for endpoint agents to search out any potentially compromised machines. Both solutions are engineered to quickly contain and block further infections in real-time across the network and endpoint. Digital Guardian also submits suspicious artifacts collected on host systems for analysis in the FireEye Malware Analysis System (MAS), with results of the analysis utilized by both solutions for containment and prevention of new infections. Manish Gupta, senior vice president of products at FireEye, added, "By integrating our respective solutions, our customers enhance their investment in FireEye with Digital Guardian's understanding of sensitive data and deep visibility and control on the endpoint. The result is a streamlined workflow engineered to stop advanced malware and prevent loss of sensitive data both on and off the corporate network." Protect sensitive data from being exfiltrated during an attack with Digital Guardian end point data protection control rules defined by FireEye IOC characteristics. According to Jim Ricotta, Verdasys CEO, "Enterprises looking to protect intellectual property and other sensitive data are finding that Digital Guardian and FireEye are fundamental components of their multi-layered defense due to their ability to accurately identify and block previously unknown attacks in real time. Now, these organizations can detect infections even when devices are outside the corporate network or when they are brought back to the network, so they can secure all personal and company-owned devices across their entire computing environment." Verdasys (http://www.verdasys.com) provides Enterprise Information Protection solutions and managed services to secure sensitive data and assure the integrity of business processes, enabling midsize and global businesses to successfully compete in collaborative and mobile environments. Digital Guardian, a Leader in Gartner’s 2012 Magic Quadrant for Content-Aware Data Loss Prevention, is a proven technology platform that provides complete, policy-based data lifecycle monitoring, classification, forensics and control on endpoints and servers, virtual machines and enterprise applications, networks, mobile devices and cloud environments. Digital Guardian protects IP and regulated data from compromise by insiders, contractors, partners and targeted cyber attacks. Since 2003, millions of Digital Guardian agents have been deployed to protect critical data for global leaders in financial services, insurance, technology, manufacturing and healthcare industries. Detecting and Containing Advanced Malware with Verdasys Digital Guardian and FireEye Malware Protection System Digital Guardian is unique in its ability to see and stop malicious actions by users and malware on endpoints.